Cat's Cradle Research Papers look at a novel by Kurt Vonnegut that took World War II, and the dropping of the atomic bomb, and made to be the end of the world. Kurt Vonnegut is a complex writer that Paper Masters can help you understand. In a research paper on Cat's Cradle, Paper Masters will explicate this futuristic work of literature and show the depth and breadth of Vonnegut's talent. Don't get frustrated with trying to understand this dystopian novel - get help on your research paper from Paper Masters. Kurt Vonnegut, Jr’s writing often defies description. It is difficult to classify his combinations of science fiction, history and satire rolled into a narrative that at times seems devoid of structure, yet somehow holds the entire work together in sheer brilliance. Vonnegut seems obsessed with apocalypse. From the firebombing of Dresden at the end of World War II, an event he witnessed as a POW and turned into his most famous work, Slaughterhouse Five. But in Cat’s Cradle (1963), Vonnegut takes another earth-shattering event from World War II, the dropping of the atomic bomb, and extrapolates it into an exploration of the end of the world. Not with fire, but in ice does the world end. Vonnegut’s apocalyptic satire finds many outlets, in themes that would later be taken up by concerned global activists. In “Tomorrow and Tomorrow and Tomorrow” (1953), Vonnegut delved into the future of overpopulation, a world where miracle drugs keep people alive for two centuries, leading to a senior citizen tyranny. Comparing these two works demonstrates Vonnegut’s ability to extrapolate a future more frightening than we can imagine, laced with satire as if to say that the very fact of the world’s teetering on the brink of apocalypse is ridiculous beyond expression. 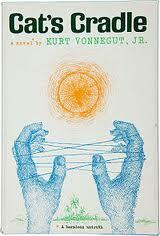 With Cat’s Cradle, Vonnegut immediately parodies America’s greatest work of fiction. Vonnegut’s Jonah is telling a prophecy, about the dangers of science and the mysteries of the universe. Character Analysis in Slaughterhouse Five - Kurt Vonnegut's novel Slaughterhouse-Five is filled with intriguing characters. Kurt Vonnegut's novel Slaugtherhouse-Five - Kurt Vonnegut's novel Slaugtherhouse-Five research papers challenge the notion of free will as one of its central themes. Order a research paper on Slaugtherhouse-Five from Paper Masters. Paper Masters writes custom research papers on Cat's Cradle sand look at a novel by Kurt Vonnegut that took World War II, and the dropping of the atomic bomb, and made to be the end of the world.